Through the howling void of purgatory that coexists alongside our reality, the creature shrieks with desire: The spirit of Colonel Sanders grows hungry again. Hungry for a fresh soul to devour, whereby it may then live anew in yet another hollowed-out body, and utter its dark encomiums to finger-lickin’ flavor. The malevolent being cackles with unholy delight, as it works its way through actor, comedian, musician—the spirit cares not what art its latest meat-suit might once have performed, so long as the consumed soul’s Q Score is at an appropriate level. 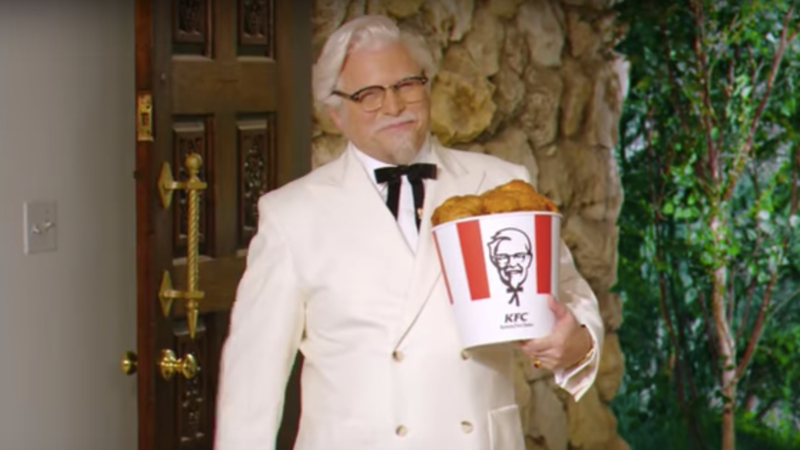 Norm McDonald, Jim Gaffigan, George Hamilton, Rob Riggle, Vincent Kartheiser, Reba McIntyre...all have screamed in agony as the beast took possession of their flesh, eyes dilating as the white hair grew in, the glasses took shape over the eyes, and the pulsating mass of dark plasm slowly formed into a shiny tub of fried chicken under the arm. But the siren song begins again! The profane incantations gibber forth from the spirit’s incorporeal maw, and its latest victim staggers, their soul rent from its vessel to forever haunt the wastelands of the afterlife. O bleak fate, o eternal torment! Let us therefore honor the latest fallen soldier in humankind’s perpetual battle against the 11 herbs and spices of the underworld. Deadline reports Jason Alexander, beloved actor and Seinfeld alum, is the new face of the pitchman for deliciously decadent poultry meals at an affordable price. “As the son of two working parents, there were plenty of dinner times when a bucket of chicken and all the fixins saved the day,” the man who was once Alexander says in a KFC release. “It’s been fun to combine my personal love for KFC with my sitcom experience into a new take on the role of Colonel Sanders.” Left out of the press release is the look in Alexander’s eyes—the last dying flicker of soul before he fades away from this plane, trapped helpless behind those glassy orbs as his body’s new owner speaks its impious truth.